The paintings - entitled the Slav Epic - have spent the last half a century hanging in a chateau in the Moravian town of Moravsky Krumlov. But officials in Prague now want them moved to the capital, prompting angry protests from the rest of the country. The Slav Epic is the soul of Moravsky Krumlov," says town mayor Jaroslav Mokry. "And Krumlov," he says, placing his hands squarely on his desk, "Krumlov is the Epic's saviour." It's a big desk, almost hidden under piles of official-looking papers. The piles are neat and orderly, just like their owner. A bust of Czechoslovakia's first president Tomas Garrigue Masaryk glares down from a shelf. "Krumlov saved the Epic from rotting away to nothing," he says, stroking an immaculately clipped beard. "Krumlov saved the Epic from the ravages of fate, from the Communists... Krumlov saved the Epic from destruction." 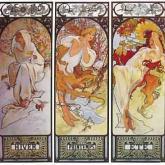 Alphonse Mucha's masterpiece hangs in the crumbling chateau, a few minutes' walk from the mayor's office. A thematic cycle of 20 enormous paintings, up to six metres tall and eight metres wide, the Slav Epic is Mucha's tribute to his people. The dreamy, almost supernatural pictures show the historical trials and tribulations of the Czech nation and the Slavs. In one haunting image, a young woman, clutching an infant to her breast, kneels over a row of ghostly corpses as her village burns in the distance. In another, Jan Amos Komensky, the "teacher of nations", sits slumped in a chair looking out over a cold, grey sea. Komensky, better known to the world as Comenius, was banished from his homeland after the Battle of White Mountain in 1620 and died in exile. "We have to know about these moments in our history in order for us to live happily and in peace," says the gallery's English-speaking guide, a young woman named Pavla Hemerkova. "These are important paintings, and I think they should stay here," she continues. "I think Mucha would also have preferred them to stay here in the end."